Hive is being presented at The Noise Project Exhibition this Friday, so here’s some documentation of our speaker wiring process, with a more detailed and explanatory post to come after the show about what we’ve learned about speakers and their functionality, as well as some shots of our sculpture’s construction. Neither of us came into this project with much experience working with speakers, or even particular knowledge of how to make it all work, so it’s all been a fun learning process that we’d like to share. First, we tested a bunch of different speakers both found and purchased to figure out the type of sound/aesthetic we’d like to apply to the hive structure. At this point we were faced with decisions like which frequency ranges are most important for representing our concept and carrying our imagined sound, which comes down to deciding which kinds and how many of each kind of drivers will be used (tweeters vs. mids vs. woofers). 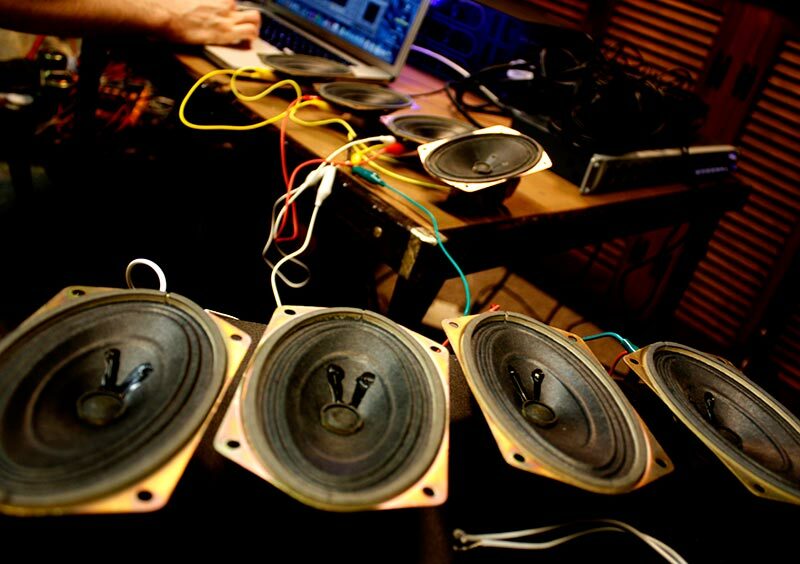 Since our goal is to produce a multi-channel soundscape for participants to explore, rather than a more traditional sound, we decided to stick to uniformity and employ a huge pile of cheap loudspeakers, most often used in car radios. Then we’re adding a couple of woofers to the top and bottom to give it some balls. 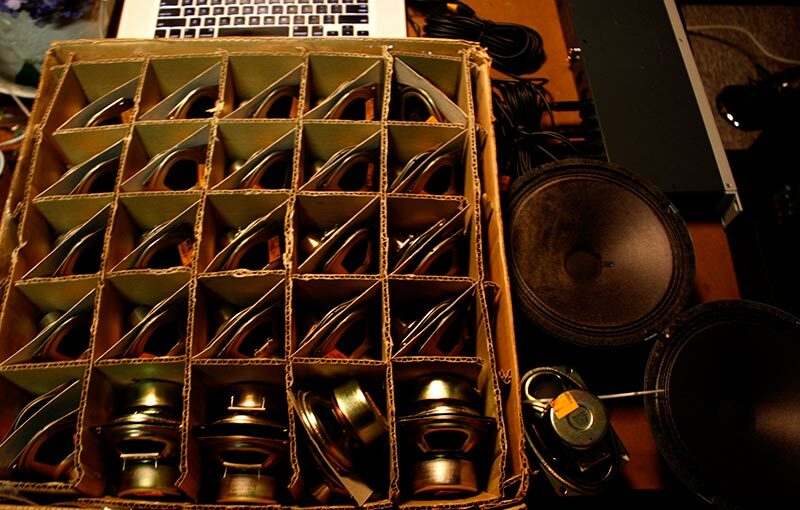 As seen above, we got ourselves 52 loudspeakers to make up the body of the hive, and were donated a couple of woofers. 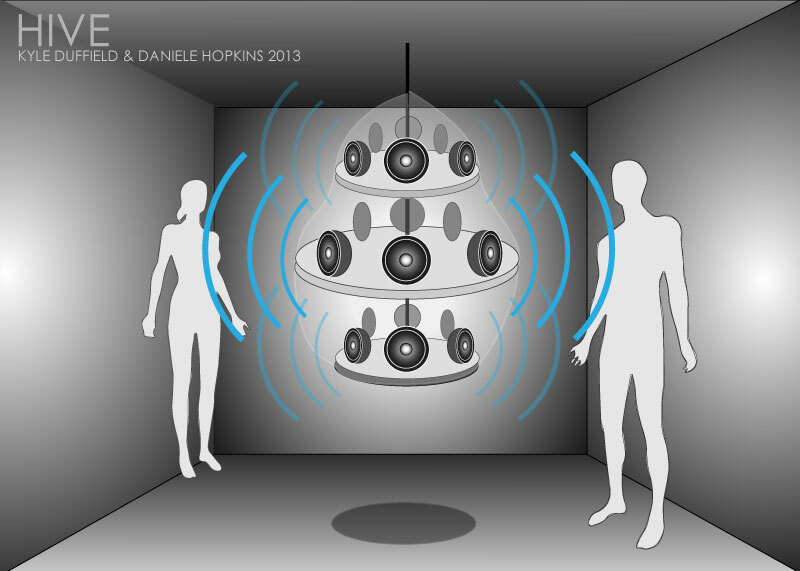 Overall, Hive is looking to have 50 speakers in total – 48 plus the two woofers. We’re wiring the loudspeakers as six channels of eight speakers, with each channel consisting of two sets of four 8 Ohm speakers. 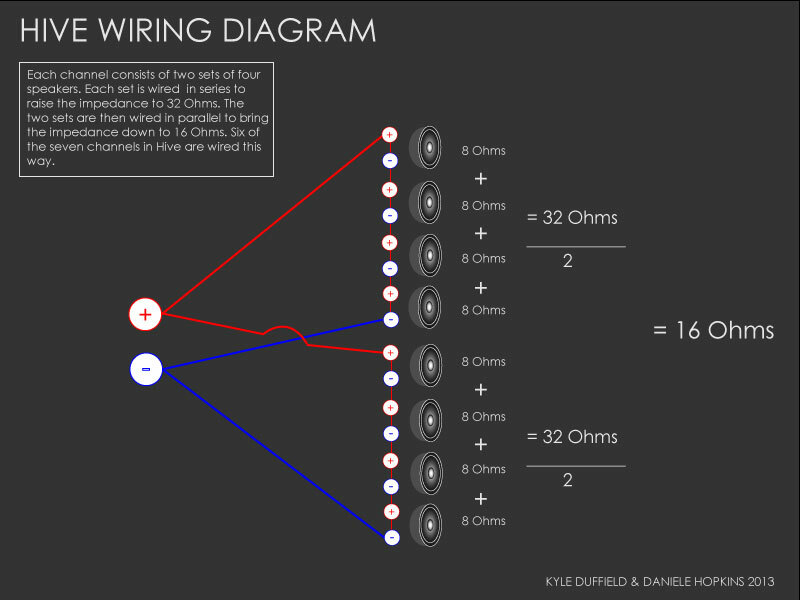 Each of those two sets will be wired in series to raise the impedance to 32 Ohms, then the two sets of four wired in parallel to bring the impedance down to 16 Ohms. The two woofers will be wired separately on a seventh audio channel. 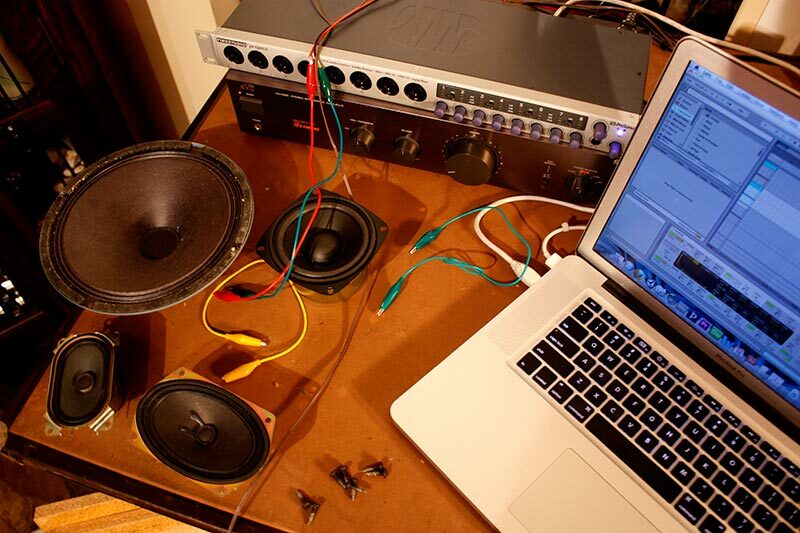 Above is a picture of one of our series-parallel speaker tests with eight loudspeakers. Sculpturally, the speaker drivers are being wired together through a chicken mesh structure stitched overtop of a bike rim skeleton. The structure will be approximately two feet in diameter and about four feet tall. But we’ll share that part of the process after the show! Opening Reception: Friday July 26th, 4:00 p.m. to 12:00 a.m. Viewing: Saturday July 27th, 11:00 a.m. to 4:00 a.m.